The communication firm is accused of stealing information from 50 million Facebook users’ profiles. AT THE CENTRE of a scandal over alleged misuse of Facebook users’ personal data, Cambridge Analytica is a communications firm hired by those behind Donald Trump’s successful US presidential bid. An affiliate of British firm Strategic Communication Laboratories (SCL), Cambridge Analytica has offices in London, New York, Washington, as well as Brazil and Malaysia. What does Cambridge Analytica do? The company boasts it can “find your voters and move them to action” through data-driven campaigns and a team including data scientists and behavioural psychologists. Cambridge Analytica claims on its website that it has data on more than 230 million American voters. “Within the United States alone, we have played a pivotal role in winning presidential races as well as congressional and state elections,” it says. 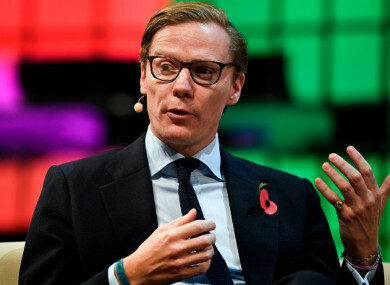 Speaking to TechCrunch in 2017, CEO Alexander Nix said the firm was “always acquiring more” data. “Every day we have teams looking for new data sets,” he told the site. Who are the company’s clients? As well as working on the election which saw Trump reach the White House, Cambridge Analytica has been involved in political campaigns around the world. In the US, analysts harnessed data to generate thousands of messages targeting voters through their profiles on social media such as Facebook, Snapchat, or the Pandora Radio streaming service. British press have credited Cambridge Analytica with providing services to pro-Brexit campaign Leave.EU, but Nix has denied working for the group. Globally, Cambridge Analytica said it has worked in Italy, Kenya, South Africa, Colombia and Indonesia. What has the company been accused of? According to the New York Times and Britain’s Observer newspapers, Cambridge Analytica stole information from 50 million Facebook users’ profiles in the tech giant’s biggest-ever data breach, to help them design software to predict and influence voters’ choices at the ballot box. University of Cambridge psychologist Aleksandr Kogan created a personality prediction test app, thisisyourdigitallife, which was downloaded by 270,000 people. The tool allowed Kogan to access information such as content Facebook users had “liked” and the city they listed on their profile, which was then passed to SCL and Cambridge Analytica. The Observer reported the app also collected information from the Facebook friends of people who had taken the test. Christopher Wylie, a former Cambridge Analytica employee, worked with Kogan and told Canadian television channel CBC the company used “private data they acquired without consent”. US hedge fund billionaire Robert Mercer – and major Republican party donor – bankrolled Cambridge Analytica to the tune of $15 million (€12 million). The Observer said it was headed at the time by Steve Bannon, a top Trump adviser until he was fired last summer. Since the news broke, Facebook has suspended SCL and Cambridge Analytica, as well as the accounts of Kogan and Wylie. In explaining its decision on Friday, the social media giant said the thisisyourdigitallife app was legitimate but accused Kogan of subsequently violating Facebook’s terms by passing the data on to SCL/Cambridge Analytica. Facebook said it found out what had happened in 2016 and was told all parties involved had deleted the data. “The claim that this is a data breach is completely false,” Facebook said in a new statement on Saturday, saying app users knowingly provided their information. Email “Explainer: What is Cambridge Analytica? The firm at the heart of Facebook's alleged data breach”. Feedback on “Explainer: What is Cambridge Analytica? The firm at the heart of Facebook's alleged data breach”.